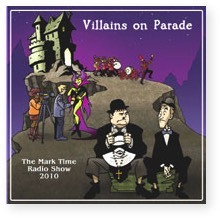 Villains on Parade" was recorded as the Mark Time Radio Show 2010 at Convergence. 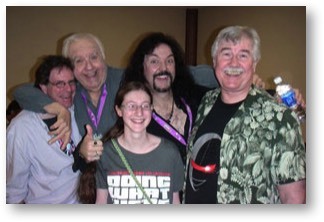 It stars Chuck McCann and Wally Wingert, along with our usual troupe. It features an Evil Sorceress, bumbling henchmen, the Annual Storming of the Castle, the Plunderers Day Parade, the Lost Orc Commentaries, and other extreme silliness. The Bad Guys have their say, the Pros take the stage and bring down the castle. Written by Jerry Stearns, Brian Price and Eleanor Price. Wally Wingert is the voice of the Tonight Show with Jay Leno, has done at least 100 different voices on "Family Guy", and has a long list of credits in film, television, anime and cartoons. Chuck McCann's performing career goes back to the 1950s, has played Oliver Hardy in any number of venues, and among other animated parts is the voice of CooCoo for Coco Puffs. Performing a goof on Laurel and Hardy with mentor, Chuck McCann, has always been a dream of Wally Wingert's. And goof they did--we're glad they got the chance on our stage.